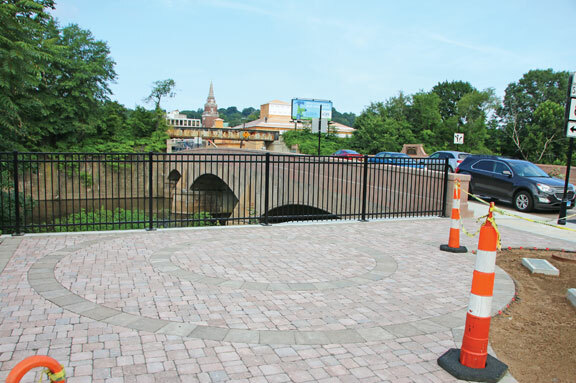 NAUGATUCK — With the Whittemore Bridge reconstruction project nearly complete, borough officials are contemplating building a monument to honor John Howard Whittemore, the bridge’s namesake. “The bridge was dedicated to John Whittemore, who, without question, is the person who has contributed more to the borough of Naugatuck than anyone else. Probably a thousand times over,” said Hess as the Board of Mayor and Burgesses discussed the idea during its Aug. 7 meeting. Whittemore, who was born in 1837, founded the Naugatuck Malleable Iron Company alongside Bronson Tuttle in 1958. During his life, Whittemore donated a number of buildings to the borough, including the library, now known as the Howard Whittemore Memorial Library, and Salem School, now Salem Elementary School. The bridge itself was dedicated to Whittemore in 1914, four years after his death. It was severely damaged during the Flood of 1955. 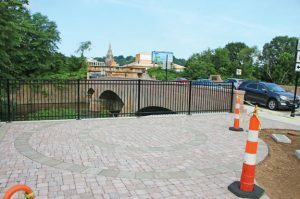 The borough began reconstructing the bridge, which spans the Naugatuck River along Maple Street, in June 2016 to restore it to how it looked before the flood. The project included bricks along the roadway and solid stone, rather than rails, along the edges of the bridge. The bridge is once again open to two-way traffic, and the project is expected to be completed by September. The project included a small “pocket park” on the eastern side of the bridge. The park is slated to be the site of the new monument. Public Works Director James Stewart presented the board with a number of options for the memorial. The most expensive option was a bronze bust of Whittemore on a granite pedestal and a bronze sign. Officials rejected this idea due to the cost, which was estimated at $28,000, and fear of vandalism. “That’s the scary part about the bust, what if somebody decides to decapitate Mr. Whittemore,” Assistant to the Director of Public Works Sandra Lucas-Ribeiro said. The board agreed on a monument that would be either a granite or stone slab with a bronze plaque. The monument is estimated to cost $15,000. The board asked Stewart to provide exact details about the monument, such as size and design, at its next meeting in September. The board plans to use money from the state Local Capital Improvement Program (LOCIP) grant or from a special account for fees collected by the town clerk to pay for the monument. The monument would not be the only place on the bridge that Whittemore is recognized. There is a bronze plaque near the train trestle at the end of the bridge, which was placed in 1914, stating the bridge was dedicated to Whittemore. A second bronze replica of that plaque was placed in the center of the bridge during the reconstruction project. While he supported the monument, Burgess Michael Bronko said something needs to be done about the bricks on the bridge that have been buckling and creating dips. The bricks on the western edge of the bridge have begun shifting, settling and coming loose, creating ruts that cars hit as they enter and exit the bridge. “I think any of these options would be a fine testament to Mr. Whittemore. But I think he would be much happier looking down on us if we were able to keep the bricks in the road from moving around and popping up,” Bronko said. Stewart said he’s working on the issue. He believes it’s an installation issue rather than a design issue. He said it’s unclear what caused the bricks to buckle and wants to make sure he knows exactly what the problem is before it’s fixed. “I want to make sure if we do the repair we have to do, it is the right thing and it actually works,” Stewart said. If Naugatuck officials worked as hard lowering the mill rate, as they do spending tax payers money… we’d have a 15 mill rate. I’m happy that the bridge is almost done and I think it looks nice. I’m not at all happy about any idea to spend money on a statue of Whittemore because it’s not a wise use of money considering all of the other issues we have here such as sewer treatment and road conditions. It’s not your money, it’s our money. Remember that.